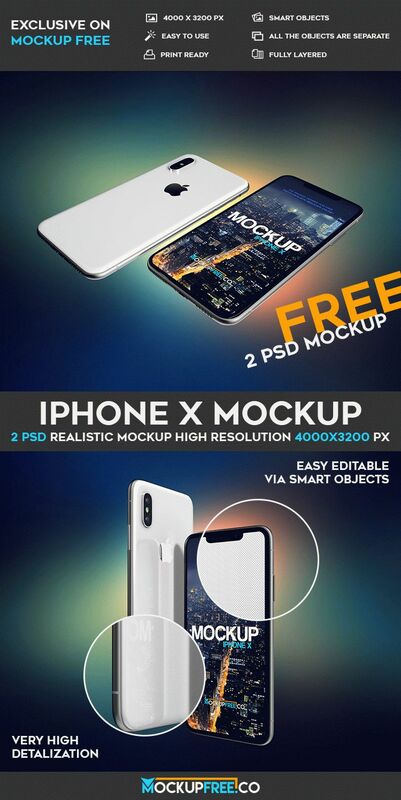 Don’t waste your time and get our new Freebie – iPhone X – 2 Free PSD Mockups for being original and of the first! Download it for free to add there your design and make your app presentation, for example, more fresh and attractive. iPhone X – it is the new smartphone from Apple company. Lots of huge queues all around the world lined up to get this new gadget, because it is truly innovative and original. New iPhone X has OLED display without frames, wireless charging, as well as an interactive touch surface. As for the coolest innovations, there is a system TrueDepth sensor that scans the user’s face and uses it to biometric identification. PSD Mockup can be useful for designers, promoters and IT specialist. If you need to create a presentation of your product or present it to your client, ready-made PSD mockup will be the best in this situation to save your time and money. It is really easy to work with this mockup in Photoshop. iPhone X is a really great, modern and powerful smartphone. Using our mockup for your work, your presentation will look very nice and certainly bring good results. After all, the design organization is also very important. We hope that these awesome iPhone X mockups will be useful for you in future. Download and enjoy!